This blog is the first in a series on easy, hearty seasonal food. 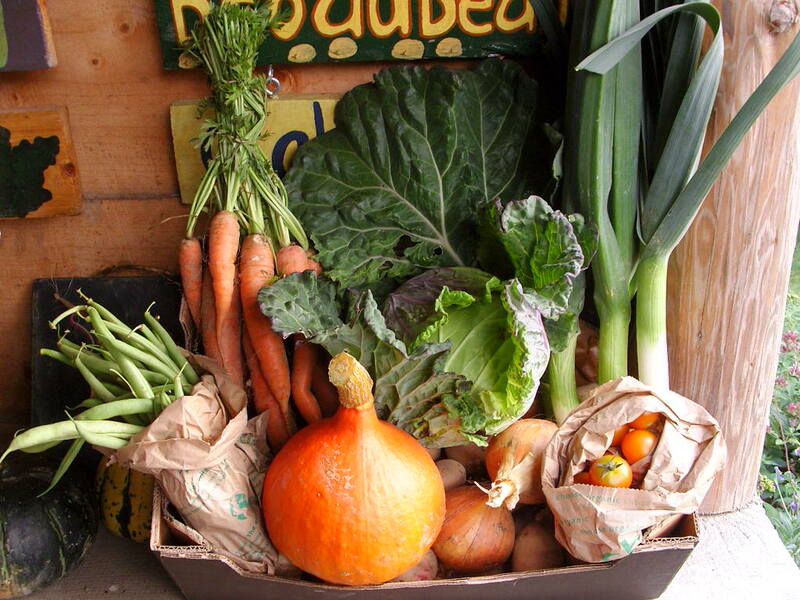 The biggest reason to eat seasonally is the flavour – out of season veg flown in from half a world away will never be as tasty as something from your local veg producer home-grown in the UK. Troed y Rhiw farm is a small family-run farm on the beautiful West Wales coast. 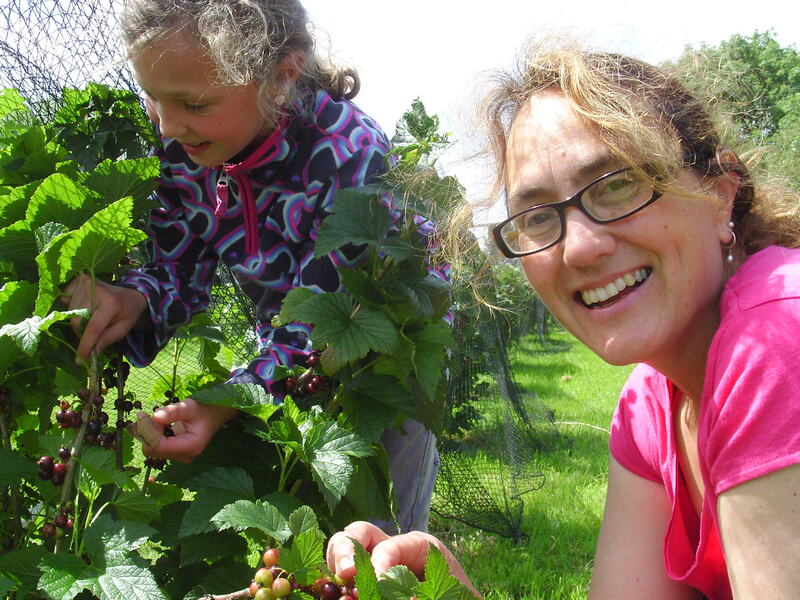 We grow 12 acres of mixed vegetables and soft fruit throughout the year . As organic veg growers, we live on what we produce as well as sell it, so we are ever inventive with our veg. I learned to cook for one reason, and one reason only – I like to eat, and I like to eat good food. My mom was a fabulous cook, but she didn’t even teach me how to boil an egg. I think she thought I’d learn by osmosis, but I didn’t. But what she did teach me, was how really good, food can be. When I left home at 18, I quickly realised that canned spaghetti sauce, was nothing like what I was used to – it’s tinny, ersatz flavour left me deeply disappointed, even when covered with copious amounts of cheese. My first year out of the house, I lived mostly on salad which I could throw together pretty easily, and I ate out, not anywhere expensive but in LA where I was living at the time, there was an abundance of good and pretty cheap food. I remember John O’Groats on Pico Blvd which had the most amazing oatmeal for breakfast, the Apple Pan with apple pie to die for and a deli which had a smoked chicken salad that I still dream about. I ate out alone a fair bit of the time, liking my own company and the lack of distraction from the food. But this love of food was bound to come home to roost, and slowly through my twenties I started to cook. My first forays weren’t promising. My cooking usually started by turning the burner on high and burning everything – for some reason it took me ages to realize there were other settings on the stove. But I got there in the end. My cooking is unpretentious, down-home, comfort food for the most part. I didn’t expect that it would become such a big part of my life. But there’s a lot I didn’t expect about my life – especially that my suburban California self would end up living in remote West Wales, running a small organic farm with my husband. Oh what I gave for love – the weather for starters, financial stability following (farming is not a money spinner…) But I eat well and that’s makes up for a lot. I often cook for upwards of 8 – 10 people a night. We have a regular roster of volunteers who come to the farm and work for us for short periods of time, to learn about farming or to have an experience when they are travelling that is more immersive. They live with us in the farmhouse, so with between 2 and 4 extra people in the house, cooking can get pretty full on. One of my favourite things to cook is pizza and it’s always immensely popular. As a purchased product, it’s usually pretty poor quality and definitely not a ‘healthy’ meal. But home-made, it’s a whole different ball game – packed with fresh vegetables, good cheese and made from scratch, I really rate it. Most people are daunted by pizza because of the crust, but it’s well-worth learning to make your own. It’s not hard and takes about ten minutes – you have to mix the ingredients together, have an understanding of what luke warm water is, and knead it for 5 minutes (i.e. push it around and massage it with your hands.) There are lots of good recipes out there, just follow the directions. Then it’s on to toppings. Here, I’ve have learned that you can put almost anything on a pizza. 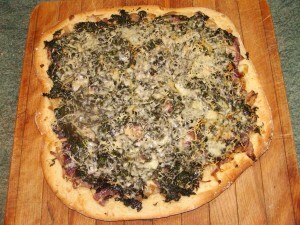 We eat seasonally on the farm, so I have a roster of year round pizzas I cook. Here’s a selection of my favourites. In addition to the ingredients I’ve listed, I always glaze the pizza base with olive oil and finely chopped garlic and add a heap of fried onions on top of my sauce. You don’t have to have them if you don’t like them, but I think they round out the flavour. Also, I use ample parmesan along with mozzerella or other cheese on my pizzas. Another tip is to use a little semolina on the baking sheet or pizza stone to keep the pizza from sticking. Fresh tomato – with either a pesto or a tomato sauce base; the key to making it especially tasty is to season well with salt and pepper across the top, with fresh basil and maybe a squeeze of lemon across the top (sounds weird but it’s ever so good). Aubergine and Feta – on a pesto base; you can add peppers or courgette to this as well, if you want. Fry the vegetables well in olive oil on medium heat before adding to the pizza – and again, always season well. Kale and Cheddar cheese – this is a Hugh Fearnley-Whittingstall idea and I was more than a little dubious about it when I first came across the recipe. However, we grow lots of the kale through the autumn, so it was well worth a try and it’s now one of my favourites. 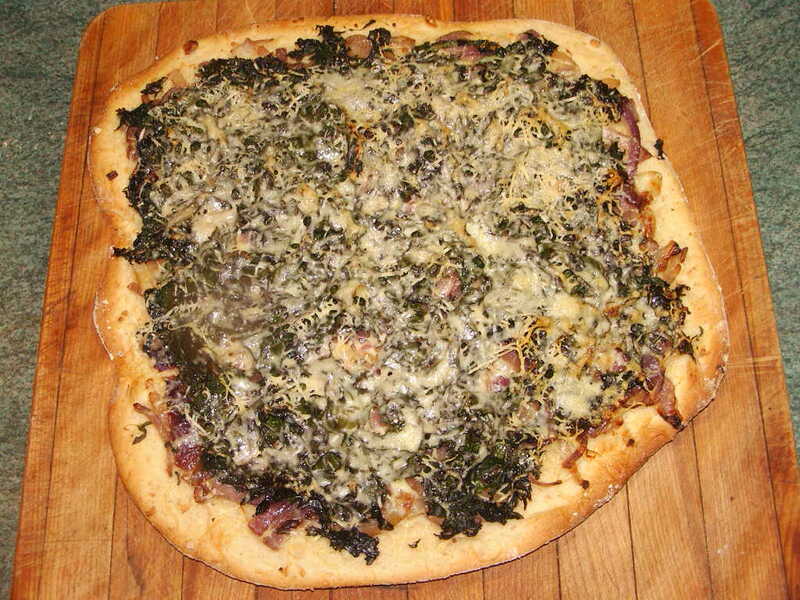 There’s no sauce on the pizza, just the onions and the garlic (and onions are really essential on this one); and you must cook the kale first until it is pretty tender and well seasoned with salt and pepper. Also give it squeeze before putting it on the pizza to get any water out. 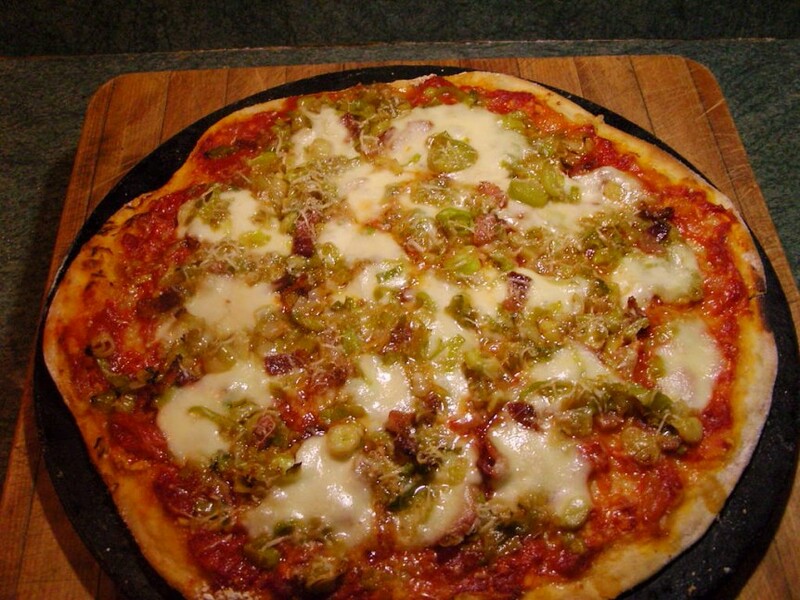 Leek and Bacon – on a tomato sauce base; cook the leeks well in butter until soft and use good quality bacon from local, free-range pigs which is generally easy to find in farmer’s markets and local shops and well worth the extra cost. Rocket, Parmesan and Caeser Dressing – on a tomato sauce base. 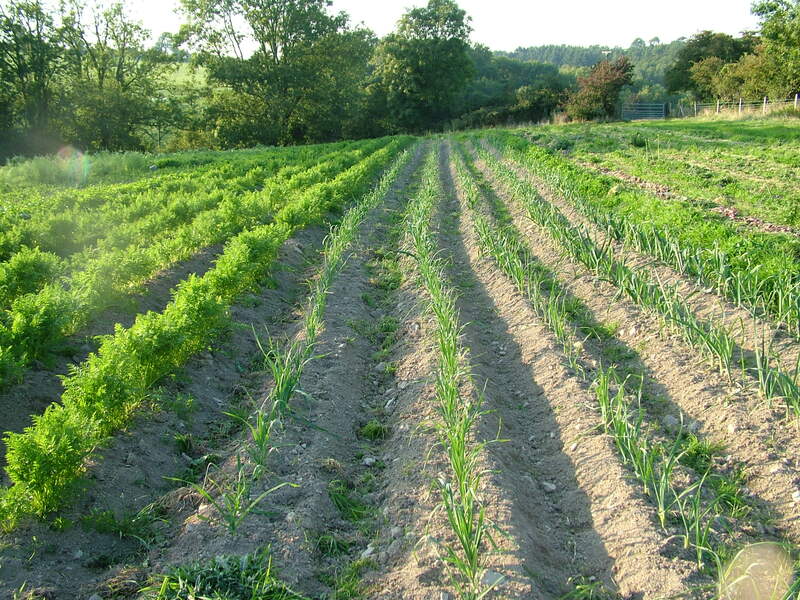 Spring is the hungry gap in the UK which means winter crops have ended and new season crops are just starting, so there’s not much around in the way of local veg. 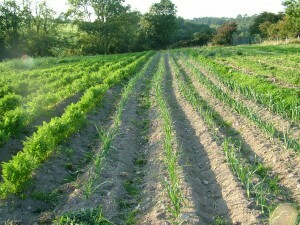 However, rocket can be sown from March on and is an early season crop. It’s very easy to grow in the UK. This pizza is a basic Margherita with your salad on top (put this on once the pizza is cooked along with a sprinkling of the dressing. The Caeser dressing gives it a good tasty kick and parmesan is a must. My last point of advice on pizzas is to be creative and try combos that you like – you can be as unorthodox as you like!